Google announced the launch of reCAPTCHA version 3 recently which promises to do away with annoying captchas by running risk assessments and giving sites control over what happens when scores below a set threshold are given. Google changed the sign-in process in 2013 from the traditional username and password form to a multi-page form. The company enabled a link between sign-ins in its Chrome web browser and Google services on the Internet in 2018. One reason more Google services consistently not to use and block wherever possible. NoScript allows you to choose the specific scripts that you need to run to sign-in. I accept we should always question their motivation but I accept Google’s explanation here. 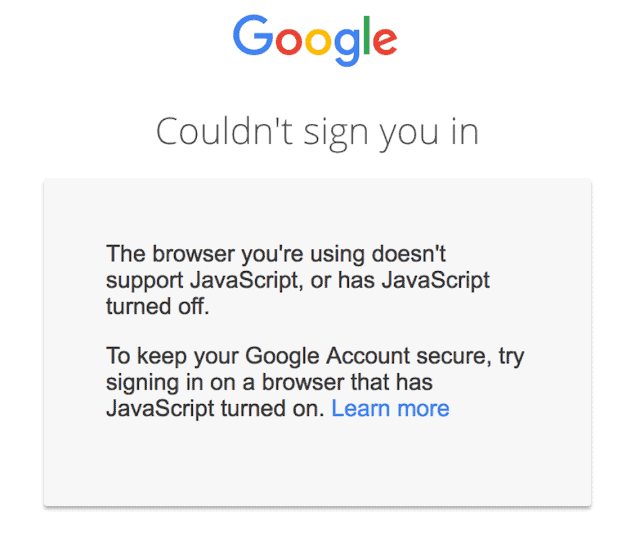 I rely on the security of Google and I appreciate them locking their browser down. Google’s revenue break down is 86% ad revenue last quarter. Google most likely wants to protect that revenue at all costs. If script blockers affect that then Google will find ways to try and stop it. But if you use Google products you shouldn’t expect Google to embrace anything that hurts their bottom line. Google is teaming with iRobot to map your home. Google “will not” use the data to sell you ads. Remember, some home cleaning robots have cameras. Some home cleaning robots have secret elephant’s trunk and sniff around for stash. They report live to your local Drug Enforcement Administration. Oh boy, are the going to run reCAPTCHA v3 each time someone logs in? A lot of people, from what I’ve seen, who don’t use Chrome have been getting 0.1 AKA Google thinks they are a bot, but they are not. A phone number is already needed to make an account. Things are getting out of hand in my opinion, at least, for those who care about privacy or who don’t use Chrome (often overlap). Run half a dozen browsers and devices, keep Google, Microsoft and the rest of the social spies off of all but one. Furthermore, Google and Microsoft are in blatant violation of the GDPR, they should be fined daily until they comply, or at least be required to disclose all the data they collect so people realize what they’re using. Mainstream users still do not comprehend what these state-controlled surveillance companies are doing. The thief requires your key to run a risk assessment of your front door lock. Google justification about “risk assessment” is ridiculous. Don’t blame the programming language, blame the abuse of JavaSript by a bunch of shady programmers. Yup, that’s how they will track you. Remember google is, after all, a advertisement company. In order to run risk assessment we need you to turn on a feature that’s super risky and exposes you to lots of risks and also please remember that by using our service you accept all responsibility for all risk that you risk risking by risking the usa of our risky business. Most importantly, what happens if the risk assesment gets you wrong and you cannot login? Because it will happen, maybe to a few people, but still. And I will take it further: imagine the day somebody in distress needs to log to a service to send a request for help and the “risk assesment” gets in the middle and trying to validate their identity they die. I know it is extreme, but this kind of unilateral i-do-what-want sh*t some services are pulling, at some point it will be too much.